Warner Bros. and Village Roadshow Pictures’ gender-bending heist film opened to $41.5 million from 4,145 locations – a series best for the “Ocean’s” franchise. Overseas, it launched with $12.2 million for a global start of $53.7 million. Women and older moviegoers bolstered box office numbers. Females accounted for 69% of audiences, while 69% were over the age of 25. “Ocean’s 8” currently has a B+ CinemaScore and 68% rating on Rotten Tomatoes. Jeff Goldstein, head of domestic distribution at Warner Bros., thanks counter-programming against a series of tentpoles for the film’s strong debut. “Ocean’s Eleven,” “Ocean’s Twelve,” and “Ocean’s Thirteen,” which released between 2001 and 2007, each bowed between $36 million and $39 million, not adjusted for inflation. Adjusted for inflation, that range climbs to $48 million and $61 million. “Ocean’s 8” represents a solid return for its star, Sandra Bullock. Her latest on-screen role was in 2015 with “Our Brand Is Crisis,” which bombed with a $3 million opening. The drama grossed only $7 million worldwide. Prior to that, Bullock starred in the critically acclaimed “Gravity.” The sci-fi thriller, which landed Bullock an Oscar nom, opened with $55.7 million and went on to make $274 domestically and $723 million worldwide. Meanwhile, Toni Collette’s “Hereditary” also got a box office boost. A24’s R-rated thriller didn’t scare audiences away – it exceeded estimates to open in fourth place with $13 million from 2,964 locations. “Hereditary” marks A24’s best opening weekend in history, outpacing 2015’s “The Witch’s” $8.8 million bow. Ari Aster’s directorial debut has been critically lauded since its debut in the Midnight section at Sundance Film Festival. Audiences appear to disagree – the horror film currently has a D+ CinemaScore and 64% audience score on Rotten Tomatoes, while its critical rating is 94% Fresh. Not all weekend openers were as fortunate. “Hotel Artemis” checked in with a dismal $3.1 million on 2,407 screens. “Hotel Artemis” represents Foster’s first big screen role since 2013’s “Elysium,” which opened with $29.8 million. The sci-fi drama went on to earn $93 million in North America and $286 worldwide. 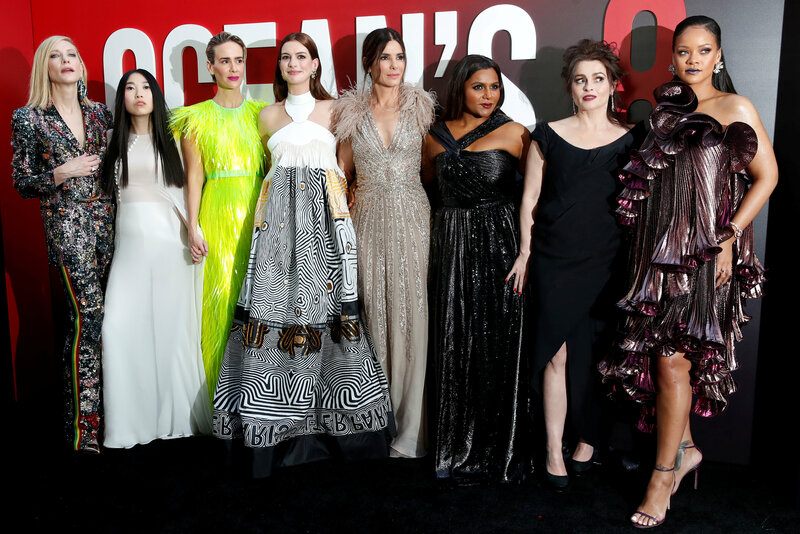 “Ocean’s 8” easily nabbed the box office crown. “Solo: A Star Wars Story” secured second place with $15.2 million in its third weekend, bringing its domestic total $176.4 million. Internationally, the Han Solo origin story brought in an additional $11.3 million. The Disney and Lucasfilm movie continues to struggle with a global tally of $312.2 million. In third is “Deadpool 2” with $13.8 million in its fourth frame. Ryan Reynold’s antihero film has pocketed $278.9 million in North America and $376 million internationally, including an $18 million overseas haul this weekend. Rounding out the top five is the seventh weekend of “Avengers: Infinity War” with $6.9 million. The Marvel adventure picked up another $10.9 million overseas, bringing its global total to $1.998 billion. Two years ago, Sony’s all-female reboot of “Ghostbusters” launched with $46 million. The sci-fi comedy – starring Melissa McCarthy, Kristen Wiig, Kate McKinnon, and Leslie Jones – struggled to sustain momentum at the box office and tapered off to $128 million in North America. With hefty production costs and expensive marketing, the remake cost Sony around $50 million. In limited release, Focus Features’ “Won’t You Be My Neighbor” launched with $470,000 on 29 screens. The documentary on the life and legacy of “Mister Rogers’ Neighborhood” host Fred Rogers stirred up positive social media buzz, with audiences sharing how the film spurred them to tears. It has a 99% Fresh on Rotten Tomatoes.